Cardi B took the stage during the Grammys on Sunday night to perform her song "Money," with the performance starting off with some smooth piano before the rapper appeared to deliver her signature attitude. Wearing a sheer black rhinestoned catsuit, the mom of one began her performance atop a sparkling piano before unveiling a peacock feather-inspired accessory and making her way onto the stage. During the performance, Cardi B's husband, Offset, was spotted in the audience clearly enjoying his wife's time onstage, with the Migos member bobbing his head to the beat with his tongue out. One person tweeted that Offset's reaction to his wife was "the most hilarious thing of the night." On the other hand, some fans didn't appreciate the choice to show Offset's reaction, tweeting that they would prefer to watch Cardi B only. All in all, most people found the whole thing pretty entertaining. Cardi B and Offset arrived on the red carpet together ahead of the show, with Cardi B wearing a dress made to give the illusion that she was a pearl rising out of a shell. The appearance seemingly confirmed rumors that the two are back together after Cardi B had announced their split in December, though one fan joked that Cardi B's outfit on the red carpet ensured that they didn't get too close. 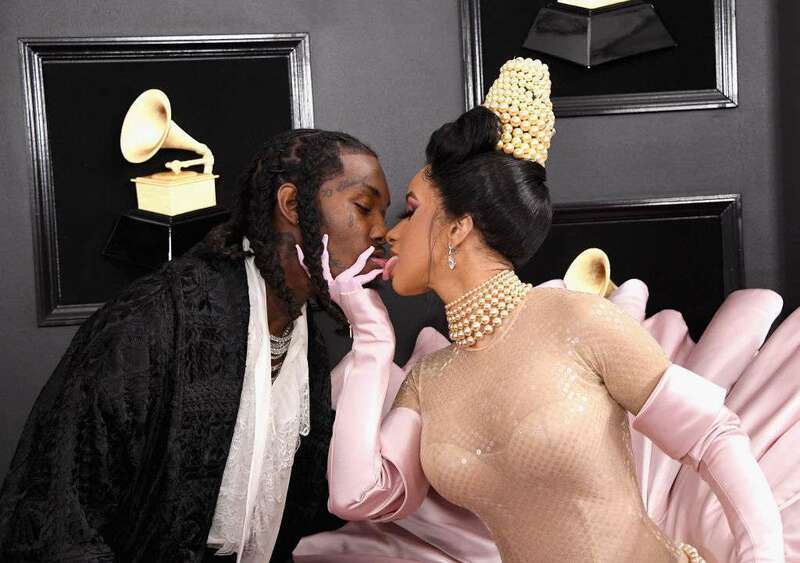 Offset's choice of reaction during his wife's performance may have been a nod to a moment they shared on the red carpet ahead of the show, with the two leaning towards each other to touch tongues as they posed for photographers. Offset was also on hand to support his wife when she won the Grammy for Best Rap Album for Invasion of Privacy, with Cardi B bringing Offset on stage with her as she gave her speech. "I wanna thank my daughter," Cardi B said of the couple's baby girl, Kulture, before adding to Offset, "Husband, thank you."